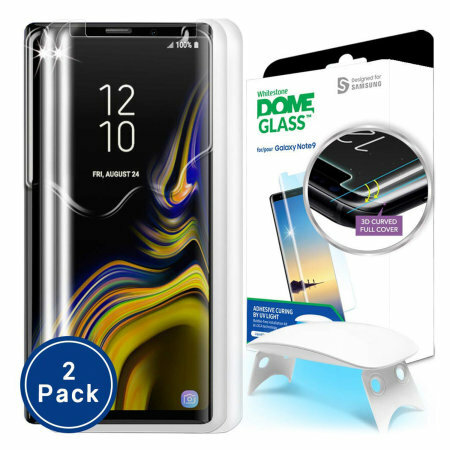 Tho the note 9 has only been out for just over a month I have tried two other screen protectors. This one is by far the best a little tricky to apply dust free and I would suggest reading the instructions as well as watching the videos on how to apply the dome glass. WORD OF WARNING DO NOT FIT THIS LIKE I DID NEAR A WINDOW ON A VERY SUNNY DAY MY FIRST ATTEMPT GOT A BIG BUBBLE IN IT DUE TO THE LOCA DRYING BEFORE IT HAD TIME TO SPREAD OVER THE WHOLE SCREEN. That said it was easy to remove and luckily I purchased the dual screen version so had 3 tubes of loca cleaned off the old loca with isopropynol went through the process again out of direct sunshine and worked a treat. You do have to be gentle removing the plastic dome glass retainer as if your to quick the glass drops onto the screen heavily causing an air bubble which can be a pain to remove. I have notified whitestone to revise their video tutorial to included the sunshine warning as it wasnt in the video but was on the first page of the instruction manual that came in the box. I thought watching the video was enough but obviously in my case it wasnt. Had to use my second dome glass yesterday as I dropped a bunch of keys on note 9 in the top left corner it saved my screen from braking even though the dome glass cracked. Screen touch sensitivity is set to normal no issues not had to turn the sensitivity up in the note9. Screen brightness and clarity looks no different with it attached. Though expensive you can get screen replacements under the life time warranty not sure of postage costs yet. Doesnt hinder the clear case I am using though one of the cheaper makes I tried kept popping off due to adhesive only round the edges and the case pushing against it tho only slight was enough to keep popping the glass off. All in all worth the effert and I have used a loca applied protector on another phone that had a cracked screen it actually made the crack almost invisible.